After a seven year absence from the hockey sector of the hobby, Panini announced the return of Crown Royale to the sport on ice this past fall. Fast forward to March and the product is one of the most diverse, interesting and awesomely tacky products of the 2010-11 hockey card season. Like most products, Crown Royale isn't without it's faults, but that doesn't mean it isn't a quality hockey card offering. In an industry filled with products that are seemingly interchangeable, at the very worst, Crown offers collectors something that strays from the beaten path and carves its own niche through it's over the top card design, interesting themes and die-cut centric set design. 2010-11 Crown Royale is a hockey card collector's hockey card product. Each $80-$100 hobby box delivers 4 packs and 4 hits. The card design isn't perfect and lacks an overall finishing touch, but you won't find me complaining about a product that delivers the shear amount of die-cuts Crown does. The base set is completely composed of die-cuts, which offers collectors a cold as ice opportunity to put together an interesting base set that is both achievable and unique. Below are trio of Crown cards that excel in terms of design. Rinkside Signatures inserts -These are essentially the "football field autographs" from Epix/Gridiron Gear, with the football field being replaced with a hockey rink. Razor's Choice inserts -These pyramid shaped die-cuts look awesome and are numbered to 99. The player selection and commentary is courtesy of Doug "Razor" Reaugh. Rookie Shillouttes inserts - Relics are incorporated through an appealing die-cut presentation and feature a signature. Crown's card design isn't terrible in any given area, it could however use some refining and more comprehensive card backs in terms of stats. Also, let's just hope that Panini's version of Crown Royale won't end up turning black (foil), wreaking like crap and stick together after 5-10 years like the late 1990's, early 2000's Pacific produced version. The checklist is tight, precise and offers the perfect amount of diversity without overdoing it. Another thing I really liked where the themes used for the inserts, which actually made sense and featured regal names like "Lords of the NHL", "In Harm's Way", "Calder Collection", "Coat of Arms", "Royal Lineage" and "Heirs to the Throne". For some reason I've always enjoyed corny card themes of this nature. 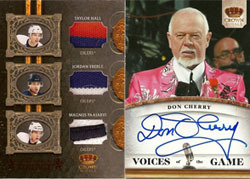 Another thing hockey card collectors will enjoy about the checklist is the "Voices of the Game" autograph insert set that includes legends like Don Cherry. The checklist also includes autographs and rookie cards of big name freshman skaters like Taylor Hall, Jordan Eberle, Jeff Skinner, P.K. Subban, Magnus Paajarvi and Tyler Seguin. One of the more intriguing singles on the checklist is the Royal Lineage triple relic featuring the Oilers big three - Hall/Eberle/Paajarvi. If there's one complaint I had with the checklist, it would be the same beef I have with nearly every Panini product, that being the strange and confusing insert parallel system that features a confusing mix of non-numbered, numbered, relic, auto, prime relic and relic auto versions of most cards. So far, the secondary market single card sales from Crown have been extremely impressive considering the relatively cheap $80-$100 box price. When it comes to the big four sports, hockey cards are routinely the safest products to break in the hobby. Hockey card collectors are notorious for their dedication to veteran players and teams, which creates an added level of depth and value that extends beyond the rookie. Another thing to like about 2010-11 Crown Royale is that at the box level, it's worth breaking. All too many product's today aren't worth breaking, yet have cards desirable cards in them. The 4-pack box structure and $80-$100 price tag strikes the perfect balance. From the die-cuts to the corny royal themes, Crown is a refreshing change of pace product that might not appeal to everyone, but those who get it will thoroughly enjoy breaking a box. To me, Crown Royale has always been a hockey product, as it's themes and card design don't translate nearly as well to sports like basketball and football. As I noted above, the product isn't perfect by any stretch of the imagination, but the fact that it's an imaginative product in an industry filled with duplicate products makes for a refreshing change of pace box break. You won't ever find me complaining about a product that strays from the beaten path.